Two important eye problems usually beginning in childhood are strabismus ("crooked eyes") and amblyopia (a "lazy eye"). Although crooked eyes can be treated with strabismus surgery at any age, early detection and treatment of amblyopia and strabismus help ensure optimal outcomes. For this reason it is recommended that children have their eyes examined by an ophthalmologist (Eye M.D.) no later than age four. Muscle imbalances in childhood may begin at any time but generally appear before six months of age. 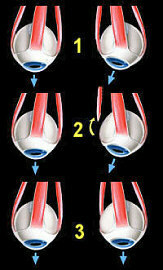 As a result of the misalignment, the crooked eye may become lazy or amblyopic. 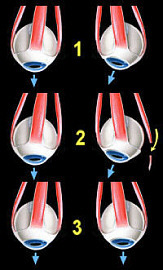 Surgery is necessary to align the eyes. 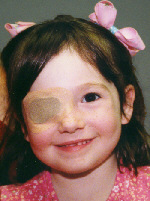 Prior to surgery, any amblyopia present is treated with patching of the good eye. Strabismus in adults is often due to medical problems such as thyroid disease, stroke, tumor, injury or a recurrence of childhood strabismus. Just as with children, eye muscle surgery is used in adults to correct the ocular misalignment. Strabismus surgery is performed by loosening (or recessing) a tight muscle (by setting it farther back on the eye) or by tightening (or resecting) a loose muscle (by removing a section of muscle and reattaching it to the eye). Sometimes both techniques are used together. It may only be necessary to operate on one eye, but in the vast majority of cases surgery is needed on both eyes in order to achieve the best alignment. Surgery is usually performed under general anesthesia on an outpatient basis. Misaligned or crossed eyes are the most common cause of amblyopia. The brain "turns off" the crooked eye to avoid double vision and the child uses only the better eye. Amblyopia can occur when one eye is more out of focus than the other because it is more nearsighted, farsighted or astigmatic than the fellow eye. The unfocused eye "turns off" and becomes amblyopic or lazy. Although the eye has poor vision it can appear normal. Consequently, this type of amblyopia is the most difficult to detect. An eye disease such as a cataract (cloudy lens in the eye) or ptosis (a droopy eyelid) may obstruct light from getting into the eye, blocking adequate vision and leading to the development of amblyopia. This is often the severest form of amblyopia.